were responsible for finding this great spiritual skystone prior to 200 B.C. Native American Turquoise Jewelry has had an eventful history and is still a large industry in the Southwestern regions of North America. Native American Turquoise Jewelry began about 200 BC as the Anasazi Indian Culture started mining Turquoise in that period of time. You can read more on Anasazi Turquoise on its presentation page. The Anasazi people started making Turquoise Jewelry as ornaments by hand grinding the Turquoise on common native rocks in their camps. Soon they learned how to drill holes in the Turquoise and started making Native American Turquoise Jewelry in the form of beads. We believe the Native American Indians of the Southwest began making Turquoise Beads around 100 BC and for certain by the turn of the millennium. 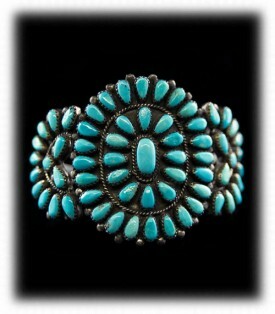 Turquoise was a sacred gemstone to the Native Americans from the beginning of the time when it was discovered. Similar to many other cultures before them in different areas of the world, the Native American Indians believed that this was a Skystone that came from the great ones above. Turquoise was worshipped and used as a healing stone by the Native American Indians just as it was over 7,500 years ago in the Holy Lands of the Middle East. 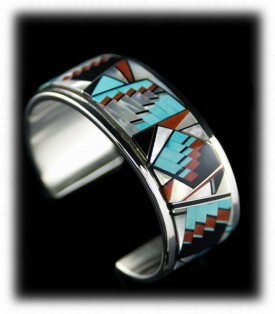 Native American Turquoise Jewelry has been being made in different forms since the Anasazi times. You can read more on the ancient history of Turquoise on our presentation page. of the Mississippi River. Turquoise was traded as far south as the bottom of the Yucatan Peninsula to the Mayans and even down into South America by 1000 A.D. Examples of Native American Turquoise Jewelry have been excavated by Archaeologists at many sites with Turquoise from the Cerrillos Turquoise Mine dating back well over a thousand years and this Turquoise was used for ceremonials, healing and adornments in the form of Turquoise Jewelry. out of the Chaco Canyon and the Mesa Verde regions to the Rio Grande Valley regions of what we now know as New Mexico, this was in the early 1400 AD period. The Santo Domingo Pueblo was located just south of the Cerrillos Turquoise Mine as well as just south of Santa Fe, which, was a major Trade Route. It is believed that the Santa Domingo Indians were making Native American Turquoise Jewelry and trading Turquoise in the form of Jewelry in the 1500's AD It is certain they were trading and marketing their Native American Indian Turquoise Jewelry in Santa Fe by 1650 AD Native Turquoise Jewelry spread to distant areas of America quickly once the Santo Domingo Indians began trading their Turquoise wears to other nomadic traders on the Santa Fe Trail. The Navajo Indians acquired Turquoise through nomadic trading prior to 1500 AD and were using it for ceremonial and medicinal purposes. It is certain the first Native American Turquoise Jewelry was Turquoise Beads that were traded from the Santo Domingo Indians. Strong evidence of Turquoise Beads have been found in early Navajo Medicine Mens bundles dating prior to 1700 AD You can read more about the Santo Domingo Indians and their Santo Domingo Jewelry on these presentation pages we have made. Historic records show the Navajo worshipped Turquoise and were wearing Santo Domingo Turquoise Beaded Necklaces, as well as their own Navajo made Native American Turquoise Jewelry regularly by 1750 AD. As settlers came west they were in need for Blacksmiths to repair their wagons and traveling gear, many Navajos picked up the Blacksmithing trade to make money from the new settlers coming west. It was about 1860 when a Navajo Indian, Atsadi Sani, learned how to work with Silver to make ornaments for horse gear and soon for self adornment. Navajo made Native American Turquoise Jewelry became highly sought after quickly by the Navajo people to be worn as adornments and also became a status symbol of wealth. Shortly after the turn of the 20th century, tourism began in the Southwestern regions of the United States mainly due to the opening of Grand Canyon National Park and demand for Native American Turquoise Jewelry increased dramatically. Navajo Indians as well as Zuni Indians and then the Hopi Indians began to make Jewelry in their homes and soon after production shops, created by Anglo Americans, began making Turquoise Jewelry to fill this great new market for Native American Turquoise Jewelry. By 1920, Turquoise Jewelry was being produced in high volume by both Native American Indians as well as Anglo Americans and even Mexican Americans in many villages, towns and cities throughout Southwestern USA. Today in 2011, the Native American Turquoise Jewelry Market is strong but tarnished. Many factors of the evolution of the world has changed the Native American Turquoise Jewelry market as we once knew it. Globalization has had a big impact on Native American Turquoise Jewelry industry. China, India, Philippines, Korea, Vietnam and many other countries now produce Turquoise Jewelry and much of it is cheap imitation copies of Native American Turquoise Jewelry. Make certain if you are paying good money for Turquoise jewelry or Sterling Silver Jewelry - it is real Turquoise and real Sterling Silver. 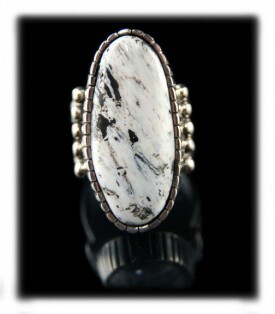 Native American Turquoise Jewelry is beautiful, spiritual and an American Heritage - We hope you will Buy American! Made in the USA! Above are two pieces of Native American Turquoise Jewelry - The Turquoise Bracelet on the left is a Zuni Indian handcrafted Bracelet made with Sleeping Beauty Turquoise from Arizona. The Navajo Turquoise pendant on the right was handcrafted with beautiful stamped silver work and a beautiful natural Turquoise gemstone from the Royston Turquoise Mine in Nevada..
To the left is an outstanding piece of Native American Turquoise Jewelry. This handcrafted Navajo Turquoise Ring has a rare spiderweb Turquoise gemstone that is highly sought after by collectors worldwide. 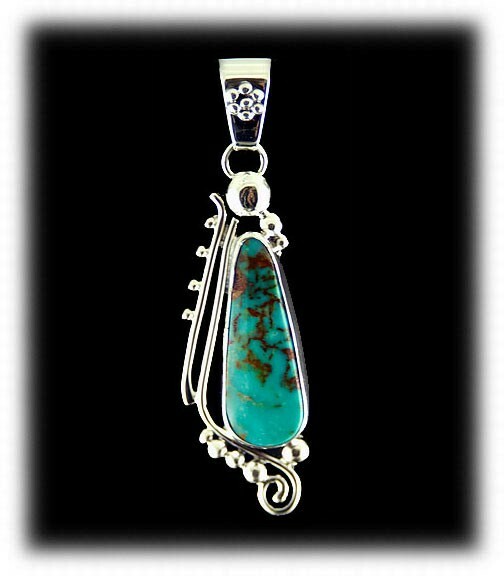 Durango Silver Company produced quality Turquoise Jewelry of this nature and is known for having some of the finest Authentic Native American Turquoise Jewelry in the world. The Native American handcrafted Turquoise Earrings on the right were made by a Navajo Indian and are of a classic Native American Indian design. This pair of Earrings have Turquoise, Coral, Gaspeite and Sugilite gemstones. 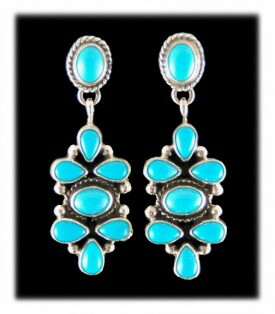 Learn more about this pair of Turquoise Earrings on their presentation page. Above are two pieces of Native American Turquoise Jewelry. The Sterling Silver Bracelet on the left was handcrafted with inlaid Turquoise, Coral, Jet and Mother of Pearl by a Zuni American Indian. The Beads on the right is a set of Vintage Santo Domingo Turquoise Beads that are of the historic Native American Turquoise Jewelry period. 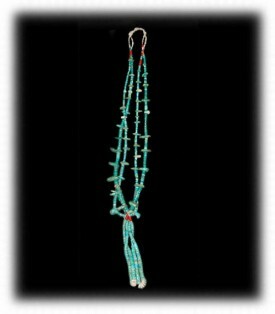 Learn more about this historic Santo Domingo Turquoise Beaded Necklace on its presentation page. We hope you have enjoyed our presentation on Native American Turquoise Jewelry and have gained some useful knowledge from it. We invite you to learn more about Turquoise and Turquoise Jewelry by following the links in our Learning Center to other informational pages that we have written on different topics related to Turquoise Jewelry. In addition, we would like to invite you to join our E-Mail Newsletter - about once every other month we send out a Newsletter to inform our members of what's happening with Durango Silver Company, new products, specials for our members and more. We also have a monthly drawing from our member base to give away free Turquoise Jewelry from our company. Please take a moment to become one of our friends by signing in below. Thank you for reading about Native American Turquoise Jewelry. We hope you have learned alot. If you would like to learn more about Native American Turquoise Jewelry please visit the second page of information about Native American Turquoise Jewelry by Clicking here.